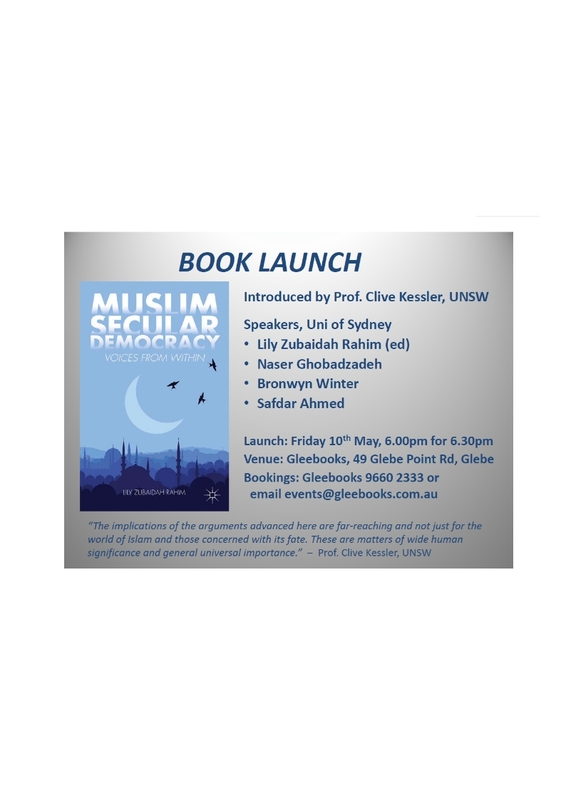 This morning there was a radio interview with Associate Professor Lily Zubaidah Rahim of the University of Sydney about her new book, Muslim Secular Democracy: Voices from within. You can listen to the interview or download it (it’s only a few minutes) from this RN page here. Where I depart from the interview itself I use grey font. In sum, Lily Rahim argues the significance of the five most populous Muslim nations — India, Indonesia, Pakistan, Egypt and Bangladesh — thriving in either full or hybrid democratic state. Most Muslim majority states today were originally conceived as secular or quasi secular democracies. But since the mid twentieth century many of these states have moved closer to the Islamic state paradigm — that is, with the onset of Islamization and political Islam that swept through the Muslim world in the wake of the Iranian Revolution in 1979. A return to the Caliphate? The interviewer asks if it is not a fact that the Caliphate, the union of religion and the state, that is at the heart of Islam. Rahim argues (along with other scholars, including Muslim scholars) that the “Islamic State” is really a modern-day twentieth century construct and that the seventh century Caliphate was a phenomenon unique to that period. The Caliphate thus cannot be repeated. The Islamic states that have arisen in more recent times are not replications of the Caliphate. Rather, they are modern attempts to legitimize ruling elites. Today it is becoming increasingly clear that experiments with Islamic states have been failures in promoting citizenship rights, modern dynamic economies, social justice, democratic rights. Obvious cases: Saudi Arabia, Iran, Sudan . . . . Yet neighboring these countries we have others ruled by secular autocrats (their states are not run as Islamic states) where the human rights situations are as bad or worse: Saddam’s Iraq, the Shah’s Iran, Syria. Rahim argues that today Muslims are increasingly and overtly rejecting both authoritarian Islamic states and authoritarian secular states. The Arab uprising was the most obvious illustration of this. This is also borne 0ut in many surveys such as those of the Gallup Poll and Pew Attitudes Survey and the World Values Survey. All these surveys show that Muslims reject the various forms of authoritarian rule. Muslims are not supportive of neither theocracy nor “the assertive secular state” such as that of France (Laïcité) or Turkey (though Turkey has moderated recently with the AKP government) where religion is not permitted in the public sphere. Muslims in France don’t like being told they cannot wear a hijab and Muslims in Iran don’t like being told they must wear a hijab. It is this compulsion that is rejected by many Muslims. Yet in the recent elections in Egypt we have the Muslim Brotherhood winning electoral success. Rahim finds that this is another example of where many Islamist parties achieve political success after a prolonged period of authoritarian rule. Rahim sees this as the result of such groups like the Brotherhood having established very strong roots and networks within the local communities during that period and they have been able to draw upon these community roots when running for elections. Certainly Islamist groups like the Brotherhood did not initiate the Arab uprising, but they benefitted from the ousting of the autocratic Mubarak in Egypt, for example because of their grass-roots networking. Liberal and secular democratic movements lacked anything like this. In the case of Syria, we have no clear idea yet on the identity of the Syrian rebels. But with respect to nonviolent protests in other parts of the Muslim world, this is the kind of paradigm [Wasatia democracy] that many democrats in the Muslim world are attracted to (as opposed to the violent groups for regime change). We cannot make sweeping generalizations about the processes of regime change in Syria, in Egypt, in Tunisia, etc since they are all quite different political scenarios. And it is the variety of situations throughout the Muslim world that Rahim explores in detail in her book. Such research does not allow for simplistic assumptions that the problem is “Islam”. In fact such research refutes such popular simplifications. I’d love to get a copy of the book, but it is the better part of $100. A pity. It sounds like the sort of information that should be far more readily accessible to the wider public. Posted on 2013-05-08 09:19:23 GMT+0000 by Neil Godfrey. This entry was posted in Politics & Society, Religion and tagged Caliphate, Egypt, Islam, Islamic State, Muslim Brotherhood, Rahim: Muslim Secular Democracy. Bookmark the permalink. Guess they can only say No or ignore my email. 🙂 But I have been encouraged to hear from the author that the work may later this year be available in paperback. I see in the amazon/canadian site that I linked in the post that the Kindle version is even MORE expensive than the hardback copy!!!! Is there anyone reading this who will be in Sydney this coming Friday evening? Yes I noticed the kindle price too – shocking robbery. I’ve never read anything on kindle. Wouldn’t want to anyway. But I still thought the whole point was that it was cheap. Not so. As for the endorsement by Kessler himself, that’s the most compelling and powerful argument he could have made to demonstrate the necessity that this book should be read by all ‘sides’. Including me. As one who has studied and read history all his life I so often find myself dismayed at the utter ignorance of how humans and societies work — as illuminated through some sense of historical awareness — by the likes of some of the most educated people: Not mentioning any names like Jerry Coyne or Richard Dawkins or Sam Harris, of course. People don’t just wake up one morning as if to day, Hey, it’s after 1979 and the Iranian Revolution, so it’s time that we Muslims starting to take our religion seriously and go out and kill anyone we can define as an enemy. Remember the Barbary Pirates! Without some sense of history and how people and societies work it is, it appears, so easy to demonize or at least dehumanize people by really believing that such a scenario is essentially realistic. But we shouldn’t need to study how people work from the text books anyway. There’s something about many of us that does prefer to simplistically categorize “the other” as “other” even in his fundamental human nature. What good is education that teaches us how to explain the origins of life and the way our brains work if it doesn’t teach us how to follow the simplest of rules to foster a civil society? The Quranic meaning of the term—-It is used in the legal concept of “Trust” , that is a settlor (God) gives a duty/responsibility (trust) to a trustee (humanity) for the beneficiary (all of God’s creation). So there is also a “green movement” in Islam based on this idea of Khalifa. MB [Neil: i.e. Muslim Brotherhood] —Prof Tariq Ramadan proposed that the Egyptian people had to choose the MB because the Saudi/Salafi’s were putting up a lot of financing to influence the Egyptian elections by backing a party of their choosing. Perhaps this dynamic—the idea that Islamists are more neutral—in that secularism is backed by the West and Salifi/Wahabi parties are backed by Saudi’s leave some muslim countries no choice but to back Islamists…. ?…….I hear that Salafi/Wahabi’s are also active in Tunisia…..but I am not that familiar with the Middle East……..
Sharia—there is a perception in the west that sharia is oppressive. (and it has been used to oppress) but to most muslims Sharia—or Law—means a system of justice based on ethico-moral principles. That is why Muslims want “religion” to be part of governance—-because to muslims religion=ethico-moral principles (not theology—as understood in the west). For example, many Asian democracies are plagued by corruption—but corruption is against the ethico-moral principles of Islam(the Quran advocates for transparency in transactions)—so there is (perhaps a naive) perception that “Islam”(or rather implementing ethico-moral principles) will solve problems of society. —Justice works for those who have money/power. There are some interesting facets to your comment. I have heard the view that the fact that churches are so influential in the United States today owes much to the “business” war against unions and labour in the nineteenth and early twentieth centuries. The only organized groups left standing (after the destruction of secular people’s movements) were the churches. The same appears to have happened in the Middle East. Iran might be seen as a paradigm. A secular democracy was overthrown by the US and UK and the Shah — who wiped out the secular opposition. That left only the clerics with an organized base and they led the counter-revolution. What your comment is suggesting is that it is the Muslims/Islamists who are discerning the realities of Western “democracy” (it is really a structure that props up the property owners/elites against the populace) and capitalism (it only works when there are controls and enforced regulations — otherwise it inevitably leads to catastrophe for the majority). That is, in the wake of the secular alternative to capitalist “Liberalism” being wasted (i.e. the demise of the old “Left” as it was expressed through major institutions and States), the Muslim religion (as much and more on a global scale) has filled in the gap left by the demise of the “Left”. It will be interesting if the end result will be another compromise — as it was, by way of one example, with the Left going back to the days of the New Deal in the US; or with the rise of moderate welfare and socialist semi-controlled economies in Europe. Not suggesting any simplistic parallel. There are always new factors. Change in the world is accelerating, there is climate change, a superpower sensing it is may be on the verge of moving into a twilight zone . . . . If so, then Rahin’s analysis and prognosis would prove correct: Wasatia/Wasatiyyah Democracy — That should appeal to Americans, too. I gather a good many of them, no more than Muslims, can abide the idea of a state that does not tolerate a public face to religion. But the along come China and India . . . . .
Iran—It is an interesting case because the traditional separation of law and state was not implemented. Instead a new idea proposed by Khomeni—that of Vilayat-e-Faqhi—that Judges(Faqhi) should rule the country—ended up merging law and state together. New Deal—Ibn Khaldun (14th Century) proposed that large governments and large armies were inefficient and government should instead spend money to improve the conditions of the subjects. He proposed low taxes so that people invest their wealth in the growth of the economy. Rather than a consumer based economy—a system in which consumption dictates growth—-Ibn Khaldun envisioned a “value” economy—one in which increasing the quality of the products created higher value and this in turn created greater circulation of wealth………….These ideas may be too old to use today—nevertheless, perhaps they can still be used as a jumping-off point when thinking of a new/different system……………. Social justice—This is is an issue that both government and citizens have to solve together—in that, it is not the sole responsibility of the government. Citizens are closer to their communities and can work out unique solutions that adapt to the circumstances and problems of the community—a “one-size fits all” type of government solution can be ineffective. China/India—are both grappling with problems of waste and wide income disparity. Much of Asia is in a growth stage so some of the problems may not be as visible now—but if we are not careful, the problems the west is facing today will eventually plague Asia as well……….. I agree that changes in geo-politics, demographics and climate might create an unpredictable future—but perhaps also an interesting one….. The Islamic states that have arisen in more recent times are not replications of the Caliphate. Rather, they are modern attempts to legitimize ruling elites. It seems that this sort of phenomenon isn’t unique to Islam: Epiphenom: Do the rich use religion to keep the poor in their place? Frederick Solt and colleagues from Southern Illinois University wanted to test an alternative theory – that the rich and powerful use religion as a tool for social control to keep the poor in their place. They call this the ‘Relative Power’ theory. Not a new idea, of course, but they came up with a couple of novel ways to test it. …many wealthy individuals, rather than simply allowing redistribution to be decided through the democratic process as such median-voter models assume, respond to higher levels of inequality by adopting religious beliefs and spreading them among their poorer fellow citizens. Religion then works to discourage interest in mere material well-being in favor of eternal spiritual rewards, preserving the privileges of the rich and allowing unequal conditions to continue. Historically we find some of the most blood-stained rulers in the Middle Ages (let’s say around the ninth century) bestowing prestige and gifts upon religious orders as if to assuage their guilt; and then the thesis that the rise of capitalism was directly related to Protestantism. Goes back to Critias, if not earlier. For those who know anything about early Islamic history, these characterizations [identifying the Caliphate with totalitarian rule and a holy war against the West] are alarmist and historically inaccurate. The caliphate for which most Muslims have a high regard is specifically that of the Rightly Guided caliphs. This is the name given to the first four men who ruled the community between 632-661, after the death of the prophet Muhammad. As recorded in early texts, the time of the Rightly Guided caliphs represents certain cherished ideals. For instance, these men who succeeded one another were not related by blood and came to power through some process of consultation. They admitted their accountability publicly, as did Abu Bakr, the first caliph, who asked the people to correct him if he should fall into error. They became fabled for their tolerance toward religious minorities and respect for the rights of women. Thus Umar, the second caliph, refused to pray in the Church of the Resurrection in Jerusalem when invited to do so by the patriarch there because he was afraid that the site might later be wrongfully claimed by Muslims as a mosque. According to the ninth-century historian Tabari, Umar promised the Christians of Jerusalem that their churches, crosses, lives and possessions would be protected. Umar also appointed a woman to the influential post of market inspector for the city of Medina and entrusted his copy of the Quran, which was the basis for the final version, to a daughter and not to a son. Many mainstream Muslims I know point to examples such as these when they wax poetic about the Rightly Guided caliphs. But a very different Umar crops up later in history as a kind of intolerant twin to the above. In contrast to the caliph described by Tabari, this Umar forbade Christians from repairing their churches and imposed humiliating restrictions on the practice of their faith. Interestingly, Umar’s double does not make his appearance in any historical source before roughly the 11th century. The second, later Umar was clearly invented in more sectarian, troubled times. Quest for worldly power and social privilege sometimes trumped fair treatment and justice and became reflected in law. This has been the unhappy experience of most societies of the world in relation to women and minorities. In our own times, when a Christian West is perceived by many to be on a collision course with the world of Islam, the alternative Umar’s harsh decrees have been marshaled to legitimize bigotry practiced by and against Muslims. We forget how much of modern Western political and legal reform was predicated on a return to the past for a selective retrieval of ideals. It was an appeal to an idealized ancient Roman republic that brought about the establishment of representative government in the West after centuries of despotism that had been justified by some on religious grounds. More recently, it was the biblical insistence on the dignity of human beings that focused attention on human rights in the West. Many of the values and practices associated with the earliest Islamic caliphate can translate into democratic governance, equal rights for women and religious minorities and creation of civil societies today. They set powerful historical and legitimizing precedents for genuine reform and revival in contemporary Islamic societies. Muslims see Islam itself as a reform movement—it brought peace to a war-torn society and established principles of brotherhood, equality, law and justice, rights and responsibilities, and the pursuit of knowledge. However, human endeavors, no matter how well intended, are imperfect….and 1,400 years of Muslim history (including the period of the 4 Caliphs) can also be understood as a slippery struggle to live upto the ideals and ethico-moral principles of the Quran and Prophet (pbuh)….a struggle that is still unfinished………..
How does this study inform us on whether or not Islam is compatible with democracy? The article tells us a few things about Muslims in Holland and Europe and reinforces Ruud Koopman’s reputation in that scene. (Europe is notorious for its discrimination and rejection of Muslims generally by contrast with North America.) Keep reading, keep learning. You will eventually learn something about the differences in the ways Muslims are accepted and treated in different parts of the Western world, and their differences within Europe, North Africa, Middle East and Southern and South-East Asia and North America and Australia. When you put it all together you will begin to understand why Dutch professors identify the things they do in a certain part of the world and you will learn a lot about statistics and Muslims more generally and how to explain their many differences across the different geo-political-social-economic regions of the world.